At some point over the past 17 years, Laila Ali went from being the baddest woman on the planet — “She Bee Stingin’” was her nickname — to being the baddest in the boardroom. The late Muhammad Ali’s youngest daughter turned to professional boxing in 1999 as a 21-year-old, embarking on a nine-year career that included an undefeated 24-0-0 (21 KOs) record and five championship reigns. The cornrowed bruiser beat everyone from Christy Martin, the pioneer of women’s boxing, to Jacqui Frazier-Lyde, the daughter of the late Joe Frazier, longtime and formidable foe of Muhammad Ali. Ali, 38, is, by most accounts, the most dominant female athlete of all time — more unstoppable than Serena Williams. She even once “challenged” former UFC champion Ronda Rousey to a fight. But she’s also been a savvy businessperson since before she was old enough to vote. Even though her father was one of the most recognizable men in the world, Ali was a manicurist at the age of 15 and owned her own nail salon at 18. After earning an associate degree in business management from Santa Monica College, she was set to enroll in the USC Marshall School of Business, but she instead turned to boxing after watching a bout featuring Martin. Since then, Ali has launched her own line of beauty and hair-care products, hosted a boxing workout video with “Sugar” Ray Leonard, and will publish her first cookbook next summer. Ali’s also signed endorsement deals with Adidas and Kellogg, hosted NBC’s short-lived reboot of American Gladiators, has been a contestant on ABC’s Dancing with the Stars as well as Food Network’s Chopped. And in January, Ali is set to compete on the eighth season of NBC’s The New Celebrity Apprentice, the first season without Donald Trump at the helm. Movie star and former California governor Arnold Schwarzenegger replaces Trump, and the show will feature former NFL running backs Eric Dickerson and Ricky Williams and pro basketball Hall of Famer Lisa Leslie. What made you want to join The New Celebrity Apprentice? I decided to do The New Celebrity Apprentice with Arnold Schwarzenegger, because … it was just a new format … that they have with him. And then … all of the people that are a part of the show, like Jessica Alba and Tyra Banks and Warren Buffett. Those names really got me excited, and it was a good time for me to promote some of the things that I have coming up. Usually, the winner of Celebrity Apprentice chooses a charity to donate his/her winnings to. I was playing for the Women’s Sports Foundation, which I’m a former president of. It’s Billie Jean King’s organization that she started so many years ago. It fights for girls and women to have equality in sports. And also to keep them strong. I understand the importance of sports and what you learn from them as far as life skills. And she also has a GoGirlGo! program for girls in inner cities. That organization is near and dear to my heart. This was Arnold Schwarzenegger’s first year hosting. I thought he did a really good job. He got better and better as each episode went on. I think everyone did. People are going to like it. He was tough enough, but not in a disrespectful way. Out of all your castmates, who did you connect with the most? I actually connected with everyone. I was surprised, because I know a lot of times the casting process is interesting: They’re going to try to cast people that are going to have a little bit of drama, but there really wasn’t much drama with the ladies. We got along, but it was just enough. Just enough. But not too much [laughter]. Now, did they not push your buttons because you’re a former boxer? People are always going to take that into consideration when dealing with me in any situation. At the same time, I made it clear to everyone — I’m not a street fighter, I’m a professional fighter. I don’t go around beating people up. That’s not ever an option, just to punch somebody in the face. As much as I may want to, I can’t do it [laughter]. Because I, frankly, am not stupid enough to go around punching people and have lawsuits everywhere. It’s been four months since your dad passed. What’s has it been like for you? I didn’t realize four months had went by [pause]. Things have started to settle down. I mean, it was a big loss for the entire world, not just me, so everybody was mourning. Obviously it’s different as a family. But to know that my father is no longer suffering is what gives me comfort. Of course I miss him, and some days are harder than others, but at the end of the day, I understand the circle of life and how things go. I’ve continued to stay strong for my children, my family — and I know he’s happy now, so that makes me happy. 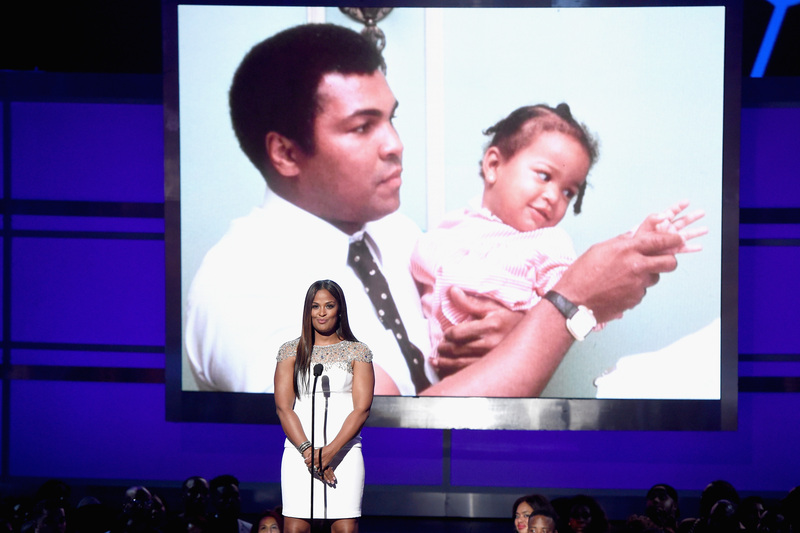 LOS ANGELES, CA – JUNE 26: An image of late boxer Muhammad Ali is projected onto a screen as retired boxer Laila Ali speaks onstage during the 2016 BET Awards at the Microsoft Theater on June 26, 2016 in Los Angeles, California. What have you learned from him that you’ve applied to your life? I believe that you should always do what’s in your heart, and stand up for what you believe in. That’s pretty much it. And that’s what I do — I do that in every aspect of my life. What makes you want to work with the National Black MBA Association? I love any time I get the opportunity to get with businesspeople and share ideas … and how to become a better leader … Because for me, over the last nine years or so, I’ve been building a lifestyle brand that’s around wellness and fitness and healthy cooking. My first cookbook is slated to come out in fall 2017. What’s going to make this cookbook stand out from other similar books out now? I’ve taken excellent food, comfort food, soul food, and turned it into recipes you can eat every day and feel good about them. How are you going to make, say, sweet potato pie nutritional? [Laughter] Actually, I have a sweet potato pie recipe that I debuted on a talk show recently. It’s called “Not Yo Mama’s” sweet potato pie, and what I’ve done is … I’m using coconut oil, and I’m also adding turmeric to the recipe, which is a spice that … cuts down on inflammation. My crust is also made with dates and walnuts, [as] opposed to white flour. Claressa Shields has won gold medals the past two Olympics. What do boxers like her need to do to make the sport shine a little brighter? What makes fighting interesting, what makes sports interesting, is to see good competition go up against each other and see who’s going to come out on top. So, unfortunately, Claressa’s going to run into a lot of the same problems I did, where you’re in a weight class where there’s even less girls, which makes for less talent. So it makes it harder to find competition, and … she’s not going to find girls that have the experience that she has. So hopefully … the Olympics will motivate more women to train. That’s when we’ll see the sport grow. Are you done with boxing forever? I’m definitely content with my decision, but anything is possible. I always have one more can to open up — no, I’m just joking. I’m very excited about some of the women I see coming up in boxing, and the fact that women’s boxing has been included in the Olympics has been amazing to me. I didn’t have that opportunity to go fight. [Boxing] was something I did for a short period of time, and I loved every moment of it. It’ll always be my first love. But I’m really focused on the things I’m doing now.